Description: A form tie would seem to be a product that is easily fashioned by most any job shop. Yet each form tie is required to contain tremendous concrete pressure. Just one bad tie, whether weakened by substandard raw material or a fractured weld, can result in a costly or dangerous situation. Ties manufactured by Symons are specially designed for use with the Steel﷓Ply Forming System and are subject to extensive quality control testing. This testing includes raw material performance; length and loop tolerance; tensile strength measurement; and coating and packaging inspection. Each tie is a dependable component in the form work layout. All Symons ties are manufactured under strict quality control and have known load ratings (see chart). These load ratings are used to determine the necessary safety factor for all Steel-Ply Forming System layouts. Symons provides the most complete selection of standard tie designs for the Steel-Ply Forming System. These designs allow for proper tie selection for each forming application. Description: The Adjustable Hanger is available in a 45 or a 90 version. The hanger attaches to a bridge beam stirrup and is designed to support onesided formwork on applications where welding is not permitted. Description: Richmond Angle Hangers are designed with a 45 degree end clip at one end are are used to support fascia overhang formwork. Description: Richmond Richco Hangers permit installation and adjustment from above the deck. Richco Hangers have a nominal setback of 3/8" and are used on interior bridge beams. Description: Richmond Richco Haunch Angle Hangers has a 45 degree end clip on one end and is used to support fascia overhang formwork. Description: Richmond Richco Haunch Hangers are similar to Richco Hangers except the haunch hangers provide for 1" to 1 1/2" haunch conditions. Description: Richmond Ty-Back Hangers are used on stell fascia beams, where welding is not permitted to take thrust out of the fascia overhang bracket without shifting. Description: Richmond Adjustable Joist Hangers are available in two sizes that accept 2x and 4x joist material. The Adjustable Joist Hanger can be used on concrete beams, steel girders and box culverts. They are adjustable and 100% reuseable. Description: The Broach Hanger is available in 45 degree or 90 degree versions. The 45 degree hanger supports fascia formwork on one end and interior formwork on the other. The 90 degree hanger supports interior formwork on both ends. Description: Fascia Overhang Brackets support bridge deck facia formwork. Brackets can be mounted to steel or concrete girders using the appropriate hanger device. Standard brackets have a 3,000 lbs. safe working load and the Adjustable bracket is rated at 4,200 lbs. safe working load. Description: Richmond Form Brace Aligners are designed to align and position all types of vertical forms and form tie systems. Combined in the field with any size stud, the Aligner provides easy adjustment for final positioning and alignment. Unit provides 5" of effective adjustment. Description: Richmond Offset Free-Fit Hangers are used for haunch conditions or where a larger than normal overhang condition is encountered. Description: Richmond Scaffold Bracket is used to support the scaffolding on nearly any type of formwork. They can be flush mounted or adjusted to fit 2x4, 2x6 and 2x8 vertical or horizontal wales and/or strongbacks. With a 4:1 safety factor, the bracket has a safe working load of 1,000 pounds. 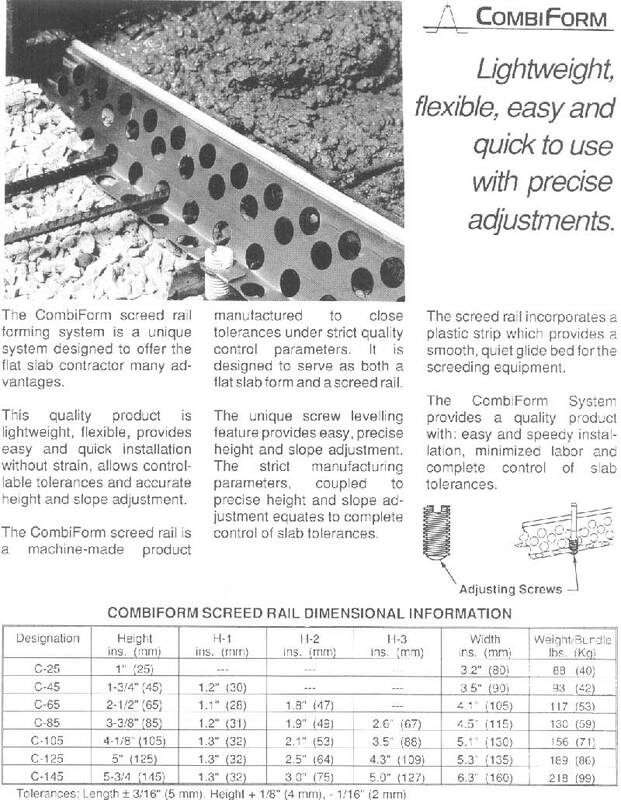 Description: The CombiForm screed rail forming system is a unique system designed to offer the flat slab contractor many advantages. The quality product is lightwieight, flexible, provides easy and quick installation without strain, allow controlable toleraces and accurate height and slope adjustment. The CombiForm screed rail is a machine-made product manufactured to close toleraces under strict quality control parameters. It is designed to serve as both a flat slab form and a screed rail. The unique screw leveling feature provides easy, precise height and slope adjustment. The strict manufacturing parameters, couples to precise height and slope adjustment equates to complete control of slab tolerances. The screed rail incorporates a plactic strip which provides a smooth, quiet glide bed for the screeding equipment. The CombiForm System provides a quality product with: easy and speedy installation, minimized labor and complete control of slab tolerances. Manufacturer: Universal Form Clamp Co. 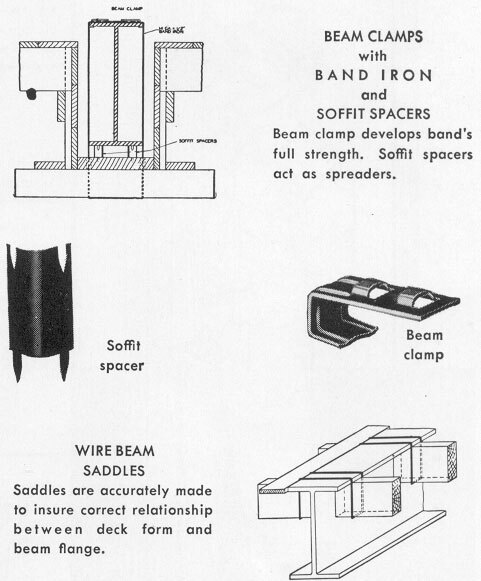 Description: Beam clamp develops band's full strength, Soffit spacers act as a speaders.